A detached house situated in an end of cul de sac location, on this popular Avenue to the south of the City of Lincoln. The property boasts a good sized and mature rear garden and has the additional benefit of off road parking to the front. Internally the property offers living accommodation to comprise of Entrance Porch, Hallway, Lounge, Breakfast Kitchen, Dining Room, Utility Room, Rear Lobby, Downstairs WC and First Floor Landing leading to three Bedrooms and Bathroom. The property further benefits from UPVC double glazing and gas central heating. The property is being sold with No Onward Chain. LOCATION The property is well located just off Doddington Road to the south of the City of Lincoln. There are a range of local amenities in the nearby Town of North Hykeham, along Tritton Road and in the City Centre which has the usual High Street shops and department stores, plus banking and allied facilities, multiplex cinema, Marina, Bailgate, with its quaint boutiques and bistros, the Castle and Cathedral. The A46 Bypass is also easily accessible via Doddington Road. ENTRANCE PORCH 9′ 6" x 7′ 0" (2.9m x 2.13m) , with UPVC double glazed external door and windows to the front elevation and door and window into the hallway. HALLWAY With stairs to the first floor, storage cupboard, radiator and doors to the lounge and breakfast kitchen. LOUNGE 14′ 9" x 13′ 3" (4.5m x 4.04m) , with UPVC double glazed window to the front elevation, two UPVC double glazed windows to the side elevation, radiator and coving to ceiling. BREAKFAST KITCHEN 12′ 0" x 10′ 1" (3.66m x 3.07m) , with UPVC double glazed window to the rear elevation, tiled flooring, fitted with a range of wall, base units and drawers with work surfaces over, tiled splashbacks, stainless steel sink unit and drainer with mixer tap, integral double oven, four ring gas hob with extractor fan over, storage cupboard, radiator, doors to the dining room, utility room and pantry with shelving and UPVC double glazed window to the side elevation. DINING ROOM 13′ 3" x 7′ 4" (4.04m x 2.24m) , with UPVC double glazed window to the side elevation, radiator and coving to ceiling. UTILITY ROOM 6′ 5" x 5′ 3" (1.96m x 1.6m) , with UPVC double glazed window to the rear elevation, partly tiled walls, plumbing for washing machine and door to the rear lobby. REAR LOBBY With UPVC double glazed window to the rear elevation, doors to the store room and downstairs WC. 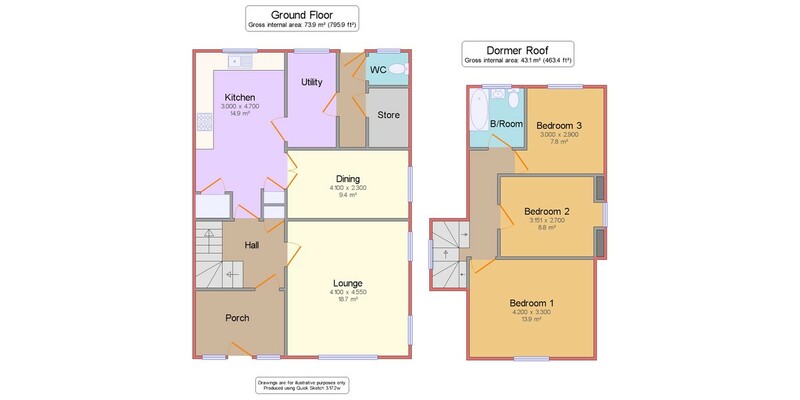 DOWNSTAIRS W.C With UPVC double glazed window to the rear elevation, fully tiled walls and low level WC. FIRST FLOOR LANDING With UPVC double glazed window to the side elevation, banister rail, eaves storage and doors to three bedrooms and bathroom. BEDROOM 1 13′ 6" x 10′ 9" (4.11m x 3.28m) , with UPVC double glazed window to the front elevation, eaves storage and radiator. BEDROOM 2 9′ 4" x 8′ 8" (2.84m x 2.64m) , with UPVC double glazed window to the rear elevation and radiator. BEDROOM 3 9′ 6" x 8′ 8" (2.9m x 2.64m) , with UPVC double glazed window to the side elevation and radiator. BATHROOM With UPVC double glazed window to the rear elevation, suite to comprise of low level WC, wash hand basin and bath, fully tiled walls, heated towel rail, access to the roof void and airing cupboard housing the hot water cylinder. OUTSIDE To the front of the property there is a paved driveway providing off road parking and a gravelled area to the side. There is access to both sides leading to the rear garden. The rear garden has a paved seating area leading to a good sized gardens with a variety of mature plants, shrubs and trees, rockery, planters, gravelled beds, greenhouse and garden shed.